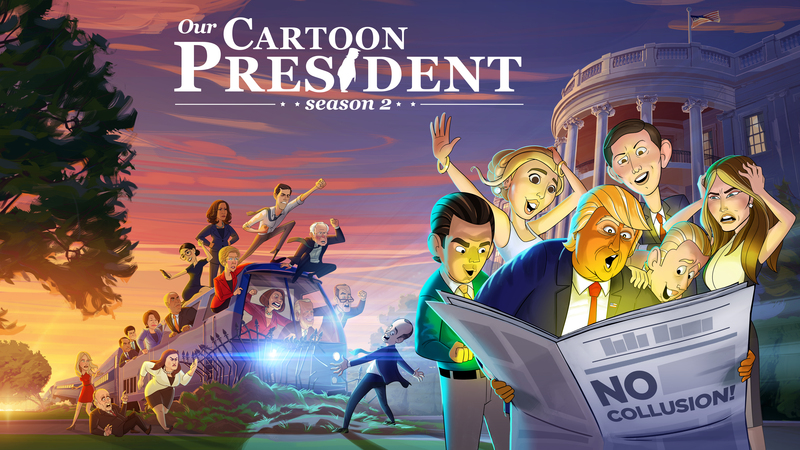 LOS ANGELES – April 9, 2019 – SHOWTIME will premiere the second season of its animated comedy series OUR CARTOON PRESIDENT on Sunday, May 12 at 8 p.m. ET/PT, and will feature an animated appearance from Queer Eye’s Jonathan Van Ness. Additionally, SHOWTIME has released the official key art and trailer for season two, which will consist of 10 half-hour episodes. To watch and share the trailer for the second season of OUR CARTOON PRESIDENT, go to: https://youtu.be/3ecmSKBQVZQ. Executive produced by multiple Emmy® winner Stephen Colbert, showrunner R.J. Fried and Late Show executive producer Chris Licht, OUR CARTOON PRESIDENT follows the tru-ish misadventures of the 45th President of the United States, Donald J. Trump, and his merry band of advisors and family members. Season one introduced audiences to Trump’s attempts at “winning” the State of the Union address, comforting disaster victims and rolling back President Obama’s accomplishments, as well as his co-dependent relationship with the media. The first season premiered in February 2018, with additional episodes that aired last summer, along with a 2018 election special that aired in November. Season two features President Trump trying to convince the American people that he's the greatest, least criminal president in history as House Speaker Nancy Pelosi and Senator Chuck Schumer attempt to win back the Democratic base from newcomer Alexandria Ocasio-Cortez. Episodes include - Trump convincing the American people to pay for Trump Tower-Moscow, proving he's mentally fit enough to possess the nuclear codes and solving climate change to stop his sweating problem, all with help from his cabinet and kids Don Jr., Eric and Ivanka. The series will also follow the candidates fighting for the 2020 Democratic nomination – including Beto O'Rourke, Kamala Harris, Bernie Sanders, and Pete Buttigieg – and introduce new characters Kellyanne Conway, Elon Musk, Jeff Bezos, and My Pillow CEO Mike Lindell. The series cast and characters returning this season include: Jeff Bergman as Donald Trump and Joe Biden; Stephen Colbert as Wolf Blitzer; William Sadler as Wilbur Ross and Mitch McConnell; James Adomian will voice Bernie Sanders, My Pillow CEO Mike Lindell and Elon Musk; Griffin Newman as Jared Kushner; Zach Cherry as Ben Carson; Gabriel Gundacker as Don Jr., Stephen Miller, Brian Kilmeade, and Jake Tapper. Emily Lynne as Eric Trump, Nancy Pelosi and Ivanka Trump; Katie Rich as Betsy DeVos; Thomas Whittington as Chuck Schumer and Beto O’Rourke; Cody Lindquist as Melania Trump; Anna Eilinsfeld as Ainsley Earhardt; Dean Edwards as Cory Booker; Mike Macrae as Mitt Romney; Iman Crosson as Barack Obama; Benjamin Siemon as Tagg Romney; Amanda Philipson as Rachel Maddow; Jen Spyra as Hillary Clinton; Jim Santangeli as Fred Trump; Grace Edwards as Michelle Obama; John Viener as Mike Pence; Brian Stack as Ronald Reagan; Brett Davis as Anderson Cooper; Jennifer F. Jackson as Kellyanne Conway and Sarah Huckabee Sanders; R.J. Fried as Steve Doocy and Vladimir Putin; Allie Levitan as Elizabeth Warren; Bob Powers as Mike Pompeo; Zach Smilovitz as Steve Mnuchin and John Bolton; Kate Villa as Amy Klobuchar.